Annual upgrades! You won't want to miss staying in this beautiful Aqua home. 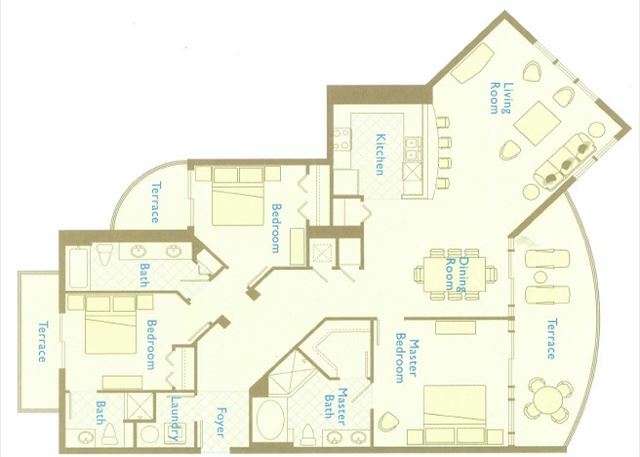 Enjoy the largest 3 bedroom corner unit at Aqua! True luxury living in this ninth floor, three-bedroom/three bath Aqua corner condominium. Enjoy beautiful sunrises and sweeping Gulf views from your private, elliptical terrace. Exquisite interior spaces include kitchen with granite counter tops, refrigerator with ice maker, microwave, and laundry with washer and dryer. Full-length windows and beautiful living spaces connect you to the magic of the Gulf. An elegant master suite features a separate glass-enclosed shower, double vanity and generous storage. Unit 901 had amazing views. The three balconies were really great and used every day. Two rooms had private balconies. The location is a 10-15 min walk to the Pier, and there are many restaurants and stores nearby. I gave 4 stars for the condition because the main TV's sound had static. I would highly recommend this unit. As a large family staying for a week along with friends and the rest of the wedding party,we could not have ask for a more perfect place. The condo was spacious and gorgeous, the view from the balcony overlooking the ocean is beautiful. The entire stay the staff was pleasant and helpful. And if you want beautiful beaches this is it! This is my 6th yesr at this condo and I will be coming back next year. We checked in late and Heather had our condo ready and waiting. Having the condo ready was really important to us as we were starting our Christmas vacation on PCB. As hectic as Christmas is, the last thing we wanted to worry about was our stay. Absolutely awesome service from this staff. It has been nine years since visiting Panama City Beach, due to work and graduate school. Therefore, I wanted to take my family to the beach and stay at a clean, updated, and inviting beach side rental. Our 3-bedroom rental was exactly what I had expected!. The property was very clean and had all the bells and whistles one would expect when looking for an enjoyable and comfortable stay on the beach. We plan to make the Aqua our condo choice in Panama City. Simply put, our home away from home.